We are Coca Seeds, the authority on coca strains.The coca seeds website team is always busy creating useful and informative articles about many topics. Ranging from the most potent cocaine coca strains in the world to cocaine addiction. Please share your stories and cocaine information with us by leaving your comments. We look forward to all your positive and negative feedback too. You can help keep this site the best resource for visitors around the world. Please contribute for good karma. If you don;t want to leave your comments you can email Carlos directly with your story and use an anonymous name. 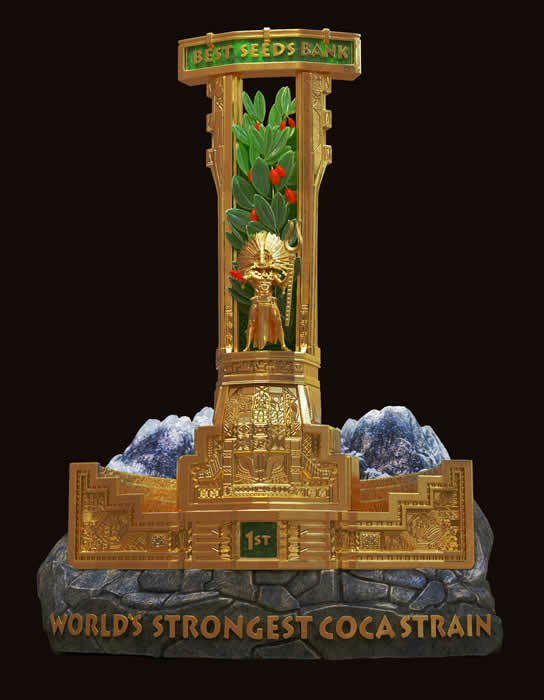 The coca cup is the world’s first trophy for the world’s best coca strains. It’s been a long time coming and we’re happy it’s finally here to stay. The third place winner is Bolivian Coca. Stayed tuned for the 2nd and first place winning coca strain next week. It’s a tough call and both cup winners will be potent, that’s for sure. The coca seeds website wants to offer its visitor the most information about cocaine. If you have any content you think would be useful, please email Carlos directly by visiting our contact page. Please visit the shop to find out more detailed information on many numerous strains. New strains will be added in the next couple days, so check back tomorrow or the next day.